©Bert Gildart: For a period of time I lived in the South and though I now live in Montana, I am constantly drawn back to renew acquaintances with friends I knew while in high school and then again in college (before transferring to Montana State University). In those years I was drawn to the countryside mostly for its excellent hunting opportunities–but also because of a growing interest in the history of the Old South. In recent years, Janie and I have returned often to the South, because there now exists an incredible national parkway that allows me to see friends and renew my fascination with both the area’s natural history and history. It does so because the parkway travels past such places as Florence, Alabama, and places me within striking distance of Huntsville, where I graduated from high school. 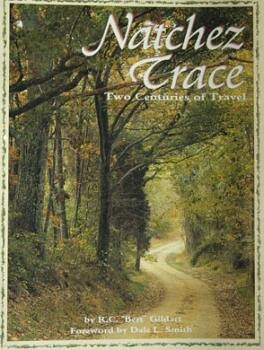 And because I’ve returned so often, several years ago I convinced interpreters at the Natchez Trace that I knew this region and that they needed a book that documented in both text and photographs some of the features this incredible area preserves. Some call the Natchez Trace National Parkway the nation’s longest national park, and though it may be that, it is also an area that explains the foundations of our country. To gather all material we needed Janie and I lived out of our Airstream for several months, traveling this area at all seasons. Stretching from historic Natchez, Mississippi, to Nashville, Tennessee, is a highway that parallels an old trail, a trail which once was a major thoroughfare for an emerging nation. Stepping from a pullout on the modern highway, Janie and I walked down a short path that ended where the much older trail began. Spanish moss on the branches above drooped over this pathway, while along the ground lay dense carpets of darkening leaves. Deeply eroded, the trail appeared ancient.Here ran the Old Natchez Trace, a trail of sublime beauty that once had seen the passage of Pushmataha, Meriwether Lewis, Andrew Jackson, Aaron Burr, John James Audubon, General Ulysses Grant, Abe Lincoln’s father—as well as thousands whose faces remain nameless. Fate had smiled kindly on many of these travelers, but not all. One black night Lewis was mortally and mysteriously wounded. The Old Natchez Trace harbors many secrets, and we took a few more steps, to learn more about the lives of those who had preceded us and to absorb the path’s pristine beauty. 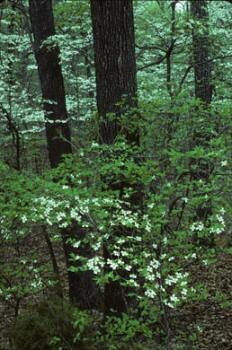 Park rangers say any time of the year is excellent for touring the Natchez Trace, but spring and fall are ideal. On a number of occasions we’ve meandered the entire 500-mile long parkway, part for pleasure and part for the business of collecting photographs and conducting research for a book ultimately published with the cooperation of the National Park Service. In the course of our travels we simultaneously explored portions of the rural South and walked existing portions of the ancient trail. Over the years the parkway has become one of our favorite drives, and the uncrowded highway has allowed us to cruise for mile after mile, stopping only because of some point of interest or because one of the Trace’s 200-plus species of wildlife demanded that we diminish our speed. General Grant: "Too beautiful to burn." Many years ago the Daughters of the American Revolution began laying the groundwork for a trip such as ours by explaining to Congress that agriculture and the development of new towns were smothering the Old Southwest’s first national highway. 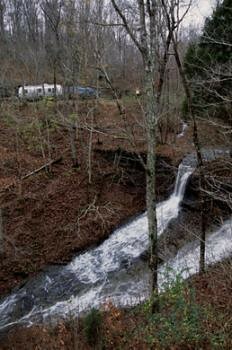 Spurred into action, in 1938 Congress designated moneys for the Natchez Trace Parkway. 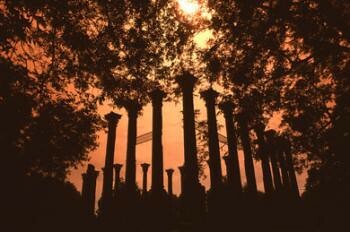 Its purpose would be to commemorate the Old Natchez Trace. Construction began soon after and, by 1995 only a few more miles needed to be completed. By and large, Kaintucks were entrepreneurs who floated goods downstream along such rivers as the Pennsylvania, Ohio, Cumberland and Tennessee. They continued their great adventure when the rivers merged with the Mississippi by floating farther downstream—slow and easy—until their trips ended at the major ports of either Natchez or New Orleans. Here, they sold their wares as well as the dismantled wood from their boats. Then, with pockets a-jingling, they returned home, making use of several paths. But the one that Indians, boatmen, itinerant preachers, soldiers and post riders beat into the archives of history became known as the Natchez Trace. Though you can easily drive the parkway in several days, you should allow at least a week (we’ve spent months). Not only does the parkway allow you the opportunity to immerse yourself in the history of the country, but as well, there are opportunities for biking and hiking. In fact, some consider a several week long bike trip along the Trace to be one of America’s great adventures. Of course we suggest you purchase our book and you can do so by E-mailing us, or you can do so by contacting the park’s bookstore. (If you contact us, we’ll provide an autographed copy of our full-color informative 8 ½ x 11 book). Regardless, now is a perfect time to visit the Trace, for flowers are in bloom and in many places the catfish are just waiting for you make them an offering. This entry was posted on Sunday, May 13th, 2007 at 8:23 am and is filed under Books & Stories, Natural History/Conservation, Photography. You can follow any responses to this entry through the RSS 2.0 feed. You can leave a response, or trackback from your own site.